A multi-talented player in college who finished second in Heisman Trophy voting in 1966, Griese was taken by the Dolphins in the first round of the 1967 AFL/NFL draft. When starting QB John Stofa was lost to a broken ankle, Griese took over and had a solid rookie season as he threw for 2005 yards and 15 TD passes for a second-year franchise. He earned selection to the AFL All-Star game in 1967 and ’68, but suffered along with a struggling team until Don Shula took over as head coach in 1970. Griese didn’t have the strongest arm, but it was accurate and he proved to be a good fit in Shula’s ball-control offense. 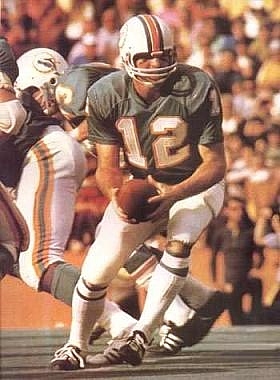 Griese followed up in 1971 by passing for 2089 yards and 19 touchdowns as the Dolphins won the AFC Championship. He was a consensus first-team All-NFL as well as Pro Bowl selection, and also received MVP and Player of the Year recognition. Griese suffered a broken leg five games into the 1972 season but returned in the playoffs as the team went undefeated and won the Super Bowl. They won again in ’73 and Griese was again selected to the Pro Bowl even though the offense was ground-oriented and he passed sparingly, although to good effect. Injuries factored into a couple of lesser seasons in 1975 and ’76, with personnel factors also an issue, but Griese, now wearing glasses, came back strong in 1977 as he led the NFL in passing (87.8 rating), TD passes (22), and yards per attempt (7.2). He was again a consensus first-team All-Pro as well as Pro Bowl selection and MVP. Griese was selected to a sixth Pro Bowl in ’78 while leading the league in completion percentage (63.0) but injuries began to wear him down and ultimately ended his career in 1980. He ended up passing for 25,092 yards with 192 TD passes and the team went 92-56-3 with him behind center. The Dolphins retired Griese’s #12 and he was inducted into the Pro Football Hall of Fame, Class of 1990. His son Brian followed him into the NFL, also as a quarterback.